Sales Incentive Programs, often called SPIFFs, are designed to connect your goals and strategies with the type of behavior that creates profitable mindshare and increased top line revenue. Sales Incentives and Sales Compensation are similar, but different - and it's important to understand the difference. While both types are crucial to a company's growth, a Sales Compensation Plan is the overall look at a sales rep's compensation - their base salary, the commission structure, bonuses, etc. A Sales Incentive Program, however, is more flexible and fluid. Incentive plans can vary from month to month - from promotion to promotion - or even from goal to goal. They integrate useful tools, communication and allow participants to feel the benefits of rewards of non-cash incentives. And, if you have a Sales Incentive Program with E2 - it's about instant gratification. Whether your sales organization is comprised of direct or indirect sales professionals, make sure they are engaged, motivated and aligned with your goals and objectives. 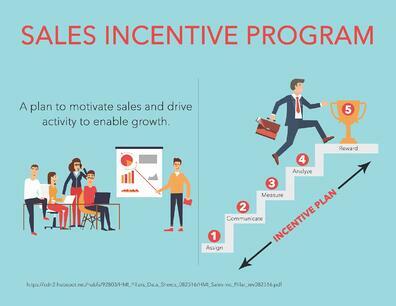 Not only will a sales incentive program have benefits for the participant, the program will also positively impact many facets of day-to-day business. To maximize all of the benefits that a program can provide, you must start building a strategy that will help align goals within your company. Energizing sales teams can be tiresome and complicated, but with a little bit of focus, your company can exceed expectations.